Pittsburgh Science and Technology Academy is being recognized as a PennCAN 2015 Opportunity School! SciTech is one of six Allegheny County schools that are beating-the-odds and proving that poverty is not an insurmountable barrier to academic success. PennCAN: The Pennsylvania Campaign for Achievement Now is a non-profit organization that advocates for policies to ensure that all students have access to a great education, regardless of their address. All staff, students and parents are welcome to join in the celebration of these schools and learn more about the practices that make them special. 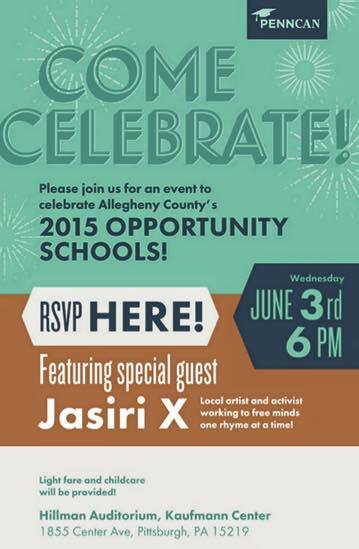 This celebration takes place on Wednesday, June 3rd at 6 PM at the Hillman Auditorium at the Kaufmann Center. This is located at 1855 Center Avenue, Pittsburgh, PA 15219. Dinner and childcare will be provided. If you plan to attend, please RSVP to Catie Stephenson: catie.stephenson@penncan.org.